Dig up the bobby pins, the clear elastics, and the strongest hairspray you own -- it's prom time, ladies. Whether you're rocking a high neck dress, or you don't want to worry about your curls falling flat all night, you can't go wrong with one of these 35 trendy prom updos. 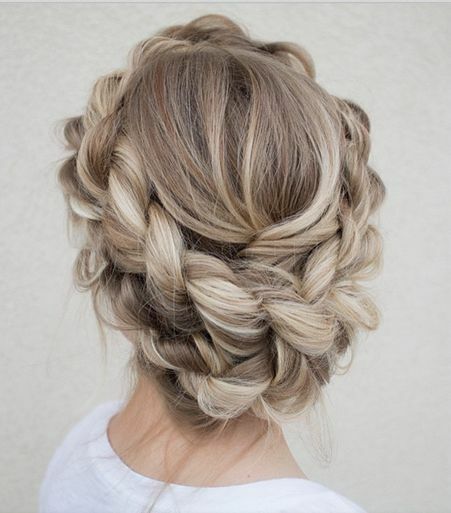 We'd wear this prom hairstyle to a picnic. We'd wear it to the grocery store. Heck, we'd wear this purposefully messy style just about anywhere. Moment of truth -- there's a certain level of confidence you must have to rock double braids at prom. But if you choose to, we'd be oh-so-proud. Calling all free spirited ladies -- flower crowns are out, and fishtail crowns are in. 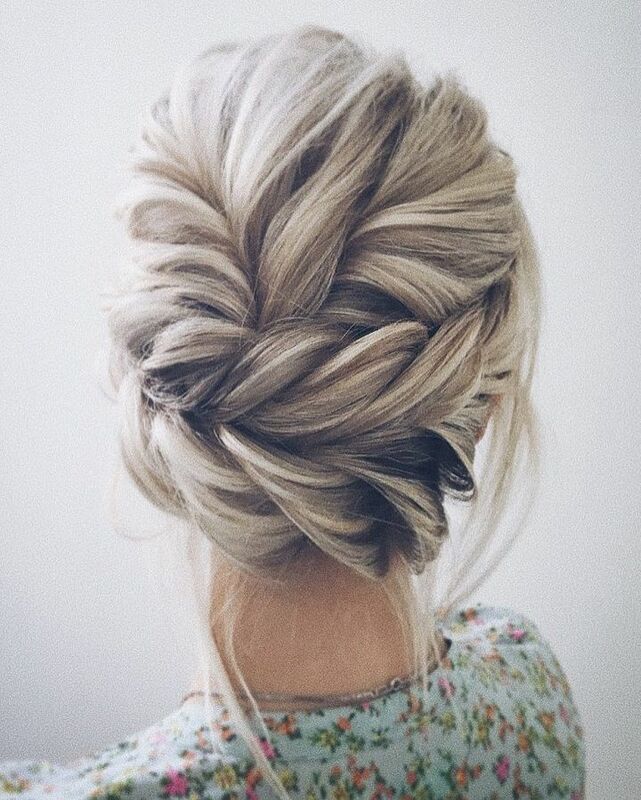 Sometimes an updo can be a piece of art all by itself. If you want to get creative, try something intricate and ornate like these stunning triple braided roses. How gorgeous would this look with an open back dress? 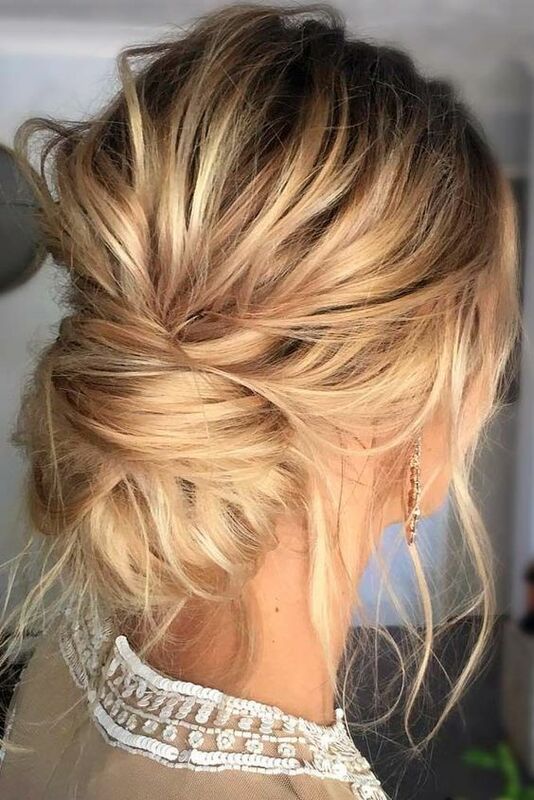 If your hair doesn't hold a curl or you're worried about it falling flat, this prom updo is for you. Play around with a little texturizing spray and dry shampoo to get the course, wavy texture. 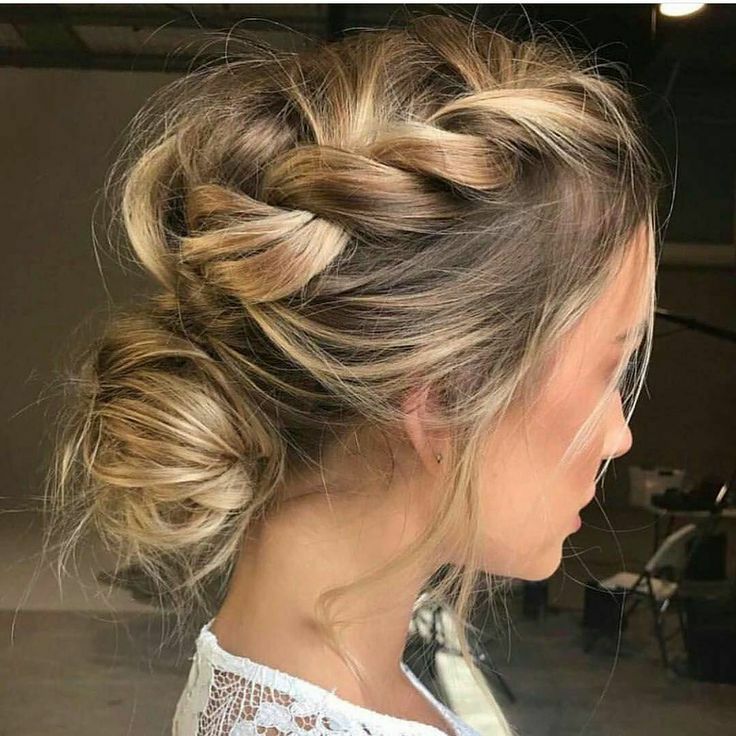 In a few easy steps, you'll be rocking this romantic low bun. Simply curl your hair with a wand, spritz with hairspray (the strong-hold kind! ), and bobby pin into place. If you have heavy, thick hair, you may need to pull hair into a loose, low pony first before pinning. Boho is back, ladies. You'll be seeing loose fishtails and braids everywhere this season, but don't worry -- not everyone's will look this good. Quick tip: It's all in the thickness of the braid or fishtail. Check out this video to maximize volume. Flaunt this flirty pony, and you won't have to think twice about your hair all night. There's that fishtail again. 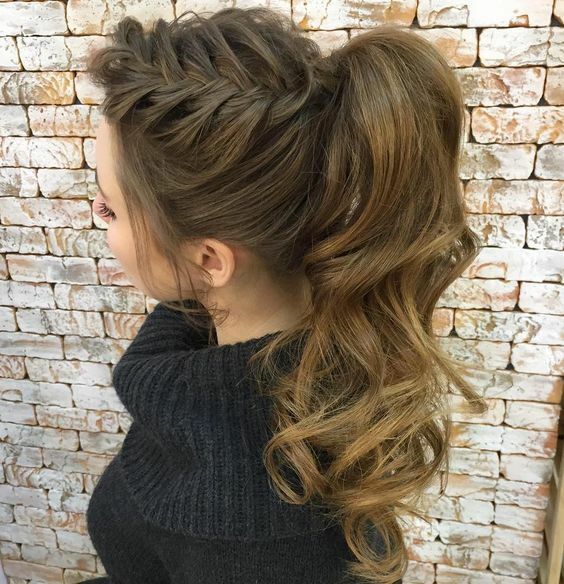 A wrap-around low pony is classy and feminine. 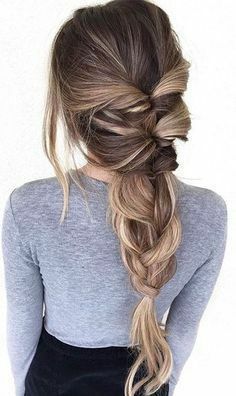 This whimsical, loose braid is super simple to replicate and looks best on ladies with thick locks. 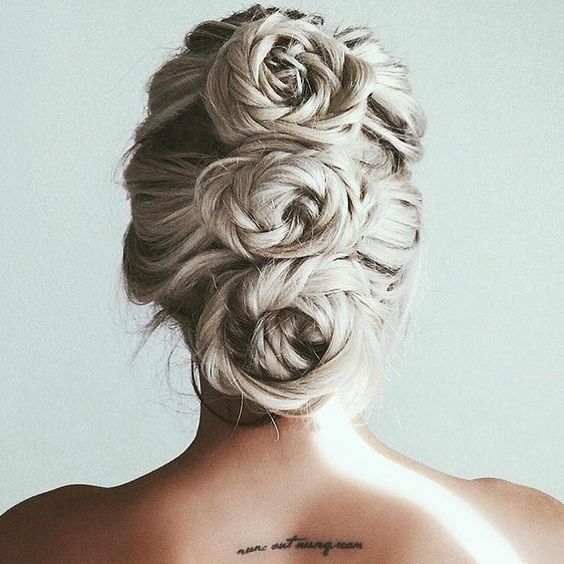 This messy bun is classy without being overdone. Just be prepared to pull 200 bobby pins out of your head on prom night. Maybe you're not into the fancy updo -- we're not judging. We love a simple style, too, and we think this one's calling your name. This effortless mermaid braid is breathtaking, and if you don't have the length or volume to replicate it, fake it. It's nothing a few clip in extensions can't handle. We'd love to see this side fishtail on ladies with open back dresses. It's a little beachy and a little boho. Nothing screams confidence more than a slicked-back pony. Why not channel your inner Selena at prom? This poised prom hairstyle tucks your hair neatly away for the night, but it's still loose enough to look feminine and romantic. Spice up the simplest prom hairstyle with a jeweled clip or flower hairpiece. Transform any low bun updo with lustrous, face-framing curls. Adding a dainty hairpiece to your undone updo is a game-changer. Try a gold hair accessory with shimmering gold eyeshadow -- you'll look like a goddess. We know we have some minimalists out there, and we love you all. No need to fuss with a complicated prom hairstyle when you can rock a simple and chic ballerina bun. We know it's not technically an updo, but can you blame us for including it? This spunky style allows you to show off bold eye makeup and those fake lashes you spent too much money on. An elegant braided bun will drop jaws on the dance floor. Try pairing it with a dainty necklace and dangling earrings to complete the look. A slicked-back style is one of the top trends this prom season and gives you the freedom to play around with funky makeup and statement jewelry. These dainty braids don't require thick tresses and can be accomplished with nearly any hair type. We're totally picturing this style with a flowy boho dress. The "undone" look is supposed to look a bit messy... like everything's out of place but exactly where it should be at the same time. If you want to take the everyday ballerina bun up a notch, try adding a chunky braided crown. It's a perfect chance to show off blunt bangs. What happens when twists, teasing, and braids make a baby? See above. If your hair isn't long enough to achieve one of the other styles, don't sweat it. 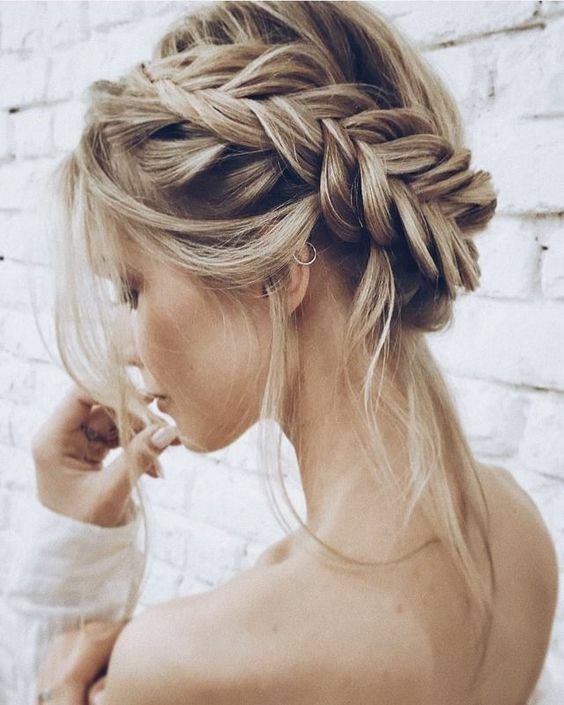 With this Dutch braid, the ends of the hair are tucked under and secured with bobby pins for a flirty, fun updo. You're probably wondering how on earth her bun is that thick? Us, too. 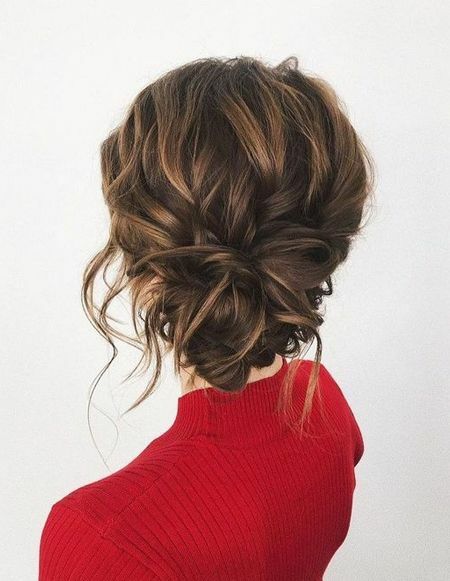 If you love the look of a gently twisted bun, but you want a little more going on, try out this bombshell look with the help of some clip-in extensions. A traditional French twist could be too sleek and stuffy for prom, but this windblown variation is a perfect compromise. 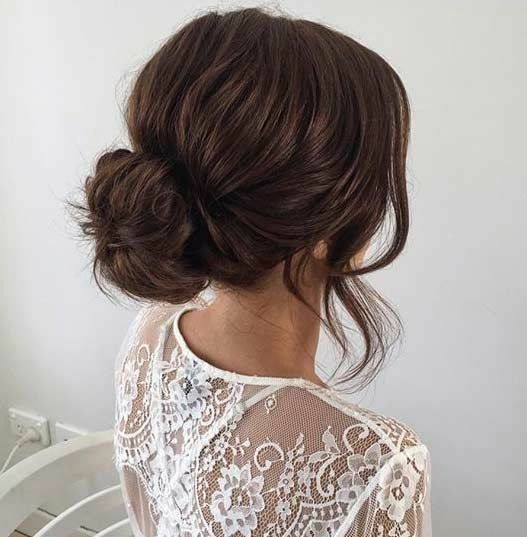 This low bun looks slightly tousled, a bit messy, and totally perfect if it’s paired with the right prom dress. Think: less glitz, more flower child. To modernize and simplify milkmaid braids, part hair down the center and braid into a low messy bun. Another gorgeous look with a bit of Greek flare is this fishtail crown braid updo. The addition of the delicate gold leaf hair jewelry completes the style. 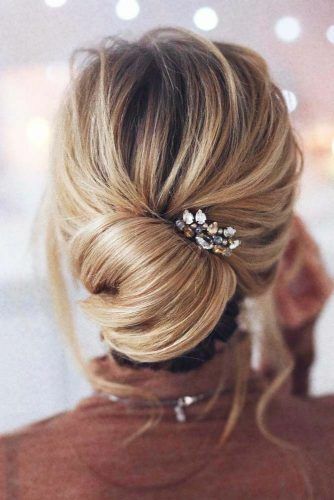 Another way to incorporate a little sparkle into your romantic style is with a crystal hair pin. 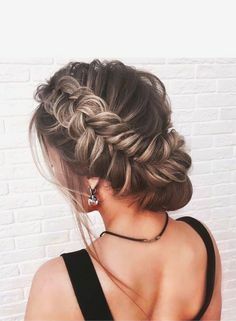 This braided updo for prom is the perfect match for any dress or style, and your woven strands will stay put until the last dance. Did you finally find the right hairstyle for prom? If so, tag us @hairstyleonpoint on Instagram or Facebook -- we'd love to see you rocking one of these looks on your special night.